Born in 1957 in Australia, master potter and sculptor, Ted Secombe has over three decades of experience at the potter’s wheel. Alas, he claims that making pots is more challenging now than when he first began; he has now developed a mastery of the medium that allows him to take his experimentation further than ever before. Ted likes to work with different shapes and now prefers much simpler forms, forms with the sense of an easy curve, “like a brush stroke”. He says: “My inspiration comes when the clay is on the wheel and I am looking at the sensuousness of the curve.” Sometimes he is influenced by the structure of plants and leaves. Ted' s other passion is gardening and he has created a glorious two-acre garden around his studio. This is Ted Secombe’s first solo exhibition in Singapore to celebrate Singapore’s 50th anniversary. He has been exhibited throughout Australia and in Sendai, Morioka and Sapporo in Japan. In 2001, he was invited to show a selection of pots in an exhibition of the world's ten top crystalline glaze technologists. In Leeuwarden, Holland, and his pots received great acclaim. 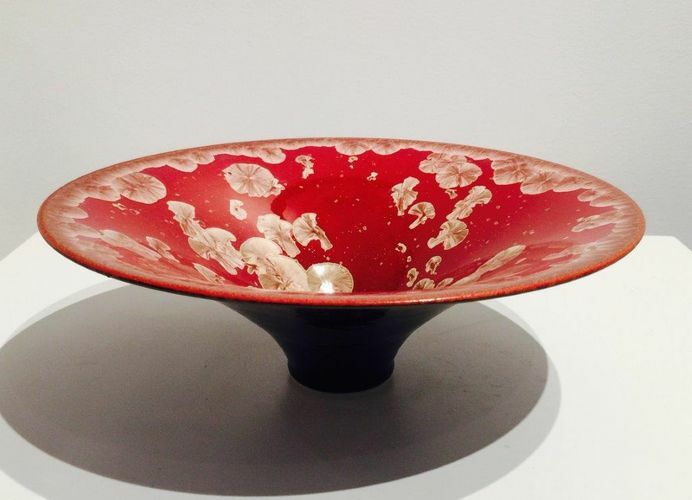 Ted's work is in many public and private collections, and he now receives commissions to produce large ceramic works for corporations and hotels in Australia, Singapore, Kuala Lumpur, Hong Kong and Shanghai.